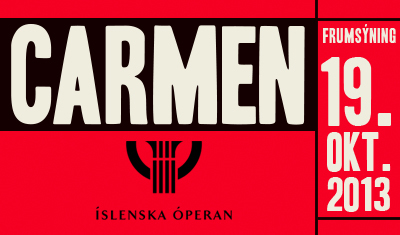 The Icelandic Opera stages Georges Bizet’s Carmen this year, with a premiere at Harpa Concert Hall on October 19th. In leading roles are Hanna Dóra Sturludóttir/ Sesselja Kristjánsdóttir as Carmen, Kolbeinn Jón Ketilsson/Garðar Thór Cortes as Don José, Hrólfur Sæmundsson/Kristján Jóhannesson as Escamillo. The conductor is Guðmundur Óli Gunnarsson, the director is Jamie Hayes, the set designer is Will Bowen, costumes are designed by Helga I. Stefánsdóttir and the choreographer is Lára Stefánsdóttir. The Icelandic Opera Choir, an Icelandic children Choir and Orchestra will furthermore participate in the production. This entry was posted in OPera and tagged Carmen, Georges Bizet, Harpa, Harpa Concert Hall, Iceland, Icelandic Opera, Islenska Operan. Bookmark the permalink. I just saw this Sunday. It was very interesting since they sung in Icelandic, but overall a great performance. The red wood panelling of the hall in Harpa really enhanced the whole mood. That’s great!! Carmen in Icelandic. Was it the first time? I am glad you enjoyed it. They did a fantastic job of translating it. I am so glad. So often translation destroy the original work or warp it so that the public gets the wrong idea… Take care.